Coconuts have slowly become a very popular and versatile food commodity. They are used in food, beauty products, etc. Their journey in becoming a renowned food item was not that easy. They were accused of artery clogging, heart disease, etc. However, they made a comeback as a miracle food. Coconuts are highly nutritious and loaded with essential nutrients that are required for healthy living. It helps in burning fat and keeps obesity at bay. Adding coconut oil while preparing cuisines helps in improving blood cholesterol level. It protects hair from damage and keeps the skin rejuvenated. While some adore the coconut water, some love its kernel. Also, there is a majority of people who love both of them. There are also available lots of product made out of the coconut. Some of them are coconut flour, coconut milk, coconut cream, coconut sugar, etc. Shimla Hills, one of the leading agro-products exporter, has to offer premium quality IQF Coconut Cubes that goes into the making of a wide range of products. They are produced from whole ripe coconut. They are sent on the inspection belts to remove any foreign bodies or over/under-ripe shredder. It is then diced by a machine to 6mm and 10mm pieces and passed through dewatering and infeed shaker to IQF. The IQF dices are then sieved, inspected and weighed and packed. The packed cartons are fed through a metal detector and transferred to cold store at -18-degree Celsius. The pieces have 18-degrees to 20-degrees brix with acid ranging from 0.2-0.3%. Special emphasis is laid on the packaging to make sure that the coconut cubes reach at your doorstep without compromising the quality. They are packed in blue color food grade LDPE bags, packed in 5-ply corrugated cartons of 10 kg. Using IQF Coconut dices for various purposes is similar to adding Coconut pieces. There is no compromise in taste or quality while converting coconut dices into IQF. 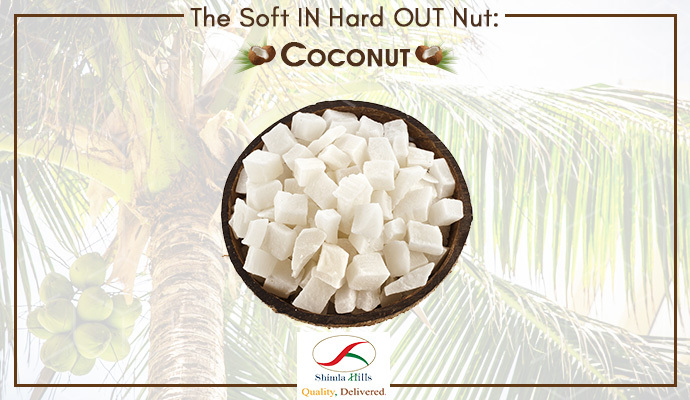 Place your order now with Shimla Hills for premium quality IQF Coconut Cubes.